Name: Latin tri = three + dentis = teeth, referring to the 3-toothed interstaminal segments of the corona. 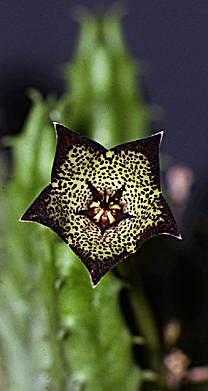 The genus Tridentea contains around 16 species of perennial stem succulents from South Africa. Frequently branching stems form mats and clumps. Several species have been moved from this genus recently, into Tromotriche. A variable species whose flower may be red to dark brown. Native to the Northern and Western Cape of South Africa and Southern Namibia.